Enjoy a hassle-free arrival in Phoenix with this private transfer service. 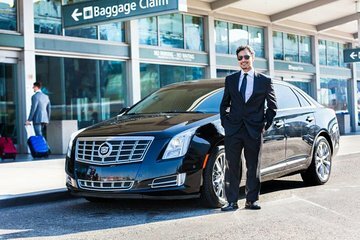 Meet your driver at Phoenix Sky Airport, and relax on the journey to your hotel or private residence in an comfortable, air-conditioned sedan. Driver was waiting for us and was very helpful in helping us find our luggage with us. Was horrible!!! Driver suppose to wait for me at the airport luggage collection area but no show and and contacted phone no given on the voucher and was told they don't have my reservation and they don't go to sedona they don't even know who is Viator I cannot imagine such thing ever happen and I have to resort to go by other means of transportation and I miss my registration also I've contacted them for my return pick up from my hotel to airport and was told they don't service sedona but I've prepaid all my booking... They told me to claim back from Viator and sent 2 email to them since 4/5 till today already a week but no respond from them yet. Very bad experience for me, I'm a frequent traveller and this is the first time such things ever happen!!!! Prompt service, clean car, friendly driver. Great service.. Highly recommend Very clean cars and courteous drivers. So easy! This was a great service.. I had a text waiting on my cell as soon as I landed so I would know exactly where my driver was waiting for me with a sign with my name on it. He walked me to the baggage claim and assisted with my luggage. The car was spotlessly clean and the great thing is that the gratuity is included so I didn't have to think about how much to tip. Thank you!